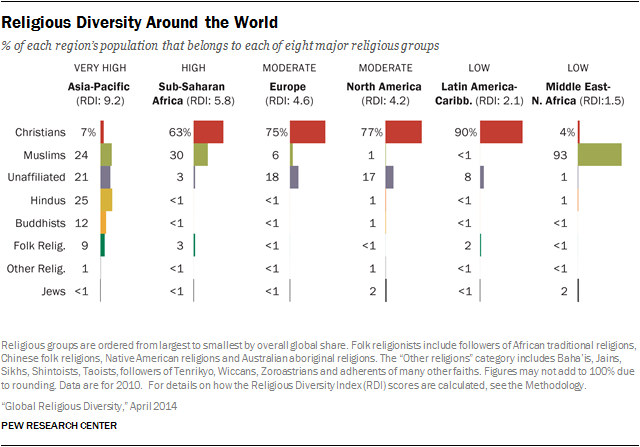 Several years ago, the Pew Research Center produced estimates of the religious makeup of more than 200 countries and territories, which it published in the 2012 report “The Global Religious Landscape.” The effort was part of the Pew-Templeton Global Religious Futures project, which analyzes religious change and its impact on societies around the world. As part of the next phase of this project, Pew Research has produced an index that ranks each country by its level of religious diversity. This study, however, takes a relatively straightforward approach to religious diversity. It looks at the percentage of each country’s population that belongs to eight major religious groups, as of 2010.2 The closer a country comes to having equal shares of the eight groups, the higher its score on a 10-point Religious Diversity Index. The choice of which religious groups to include in this study stems from the original research that was done for “The Global Religious Landscape” report. That study was based on a country-by-country analysis of data from more than 2,500 national censuses, large-scale surveys and official population registers that were collected, evaluated and standardized by Pew Research staff and, in the case of European countries, by researchers at the International Institute for Applied Systems Analysis (IIASA) in Laxenburg, Austria. In order to have data that were comparable across many countries, the study focused on five widely recognized world religions – Buddhism, Christianity, Hinduism, Islam and Judaism – that collectively account for roughly three-quarters of the world’s population. The remainder of the global population was consolidated into three additional groups: the religiously unaffiliated (those who say they are atheists, agnostics or nothing in particular); adherents of folk or traditional religions (including members of African traditional religions, Chinese folk religions, Native American religions and Australian aboriginal religions); and adherents of other religions (such as the Baha’i faith, Jainism, Shintoism, Sikhism, Taoism, Tenrikyo, Wicca and Zoroastrianism). Some efforts to measure religious diversity have attempted to take into account subgroups of the major religious traditions.3 The main challenge in looking at religious diversity in this way is the serious data limitations for subgroups within religions other than Christianity. For most countries, Pew Research was able to generate estimates for four main types of Christians – Catholics, Protestants, Orthodox and the remainder as an “other” category.4 For some countries with large Muslim populations, Pew Research has estimated the size of two main subgroups – Sunnis and Shias – but these are only approximations, expressed in ranges.5 Beyond Christians and Muslims, cross-national demographic data on religious subgroups are generally not available. For this reason, the study is limited to the eight major categories described above. As noted in previous Pew Research reports, some of the faiths that have been consolidated into the “folk religion” and “other religion” categories have millions of adherents around the world. However, in the overwhelming majority of countries, these religions are not specifically measured in censuses, large-scale surveys or population registers. 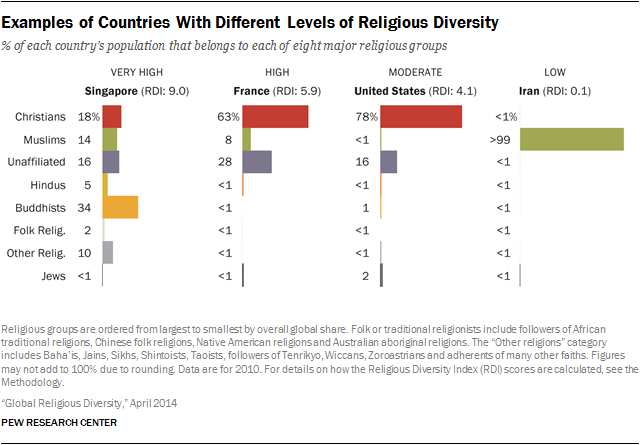 The 10-point Religious Diversity Index is divided into four ranges: Countries with scores of 7.0 and higher (the top 5%) are categorized as having a “very high” degree of religious diversity. Countries with scores from 5.3 to 6.9 (the next highest 15% of scores) are categorized as having a “high” level of diversity.6 Countries with scores from 3.1 to 5.2 (the following 20% of scores) are categorized as having “moderate” diversity, while the rest are categorized as having “low” diversity. Looking at the percentage of each country’s population that belongs to the eight major religious categories included in the study, 12 countries have a very high degree of religious diversity. Six of the 12 are in the Asia-Pacific region (Singapore, Taiwan, Vietnam, South Korea, China and Hong Kong); five are in sub-Saharan Africa (Guinea-Bissau, Togo, Ivory Coast, Benin and Mozambique); and one is in Latin America and the Caribbean (Suriname). No countries in Europe, North America or the Middle East-North Africa region have a very high degree of religious diversity as measured in this study. Of the 232 countries in the study, Singapore – an island nation of more than 5 million people situated at the southern tip of Malaysia – has the highest score on the Religious Diversity Index. About a third of Singapore’s population is Buddhist (34%), while 18% are Christian, 16% are religiously unaffiliated, 14% are Muslim, 5% are Hindu and <1% are Jewish. The remainder of the population belongs to folk or traditional religions (2%) or to other religions considered as a group (10%). By contrast, France has a high degree of religious diversity, ranking 25th among the 232 countries. Christians make up 63% of France’s 2010 population, and two other groups account for sizable shares: the religiously unaffiliated (28%) and Muslims (8%). Iran, whose population is almost entirely Muslim, falls into the low diversity category. To see how all 232 countries scored on the Religious Diversity Index, see Appendix 1 (PDF). 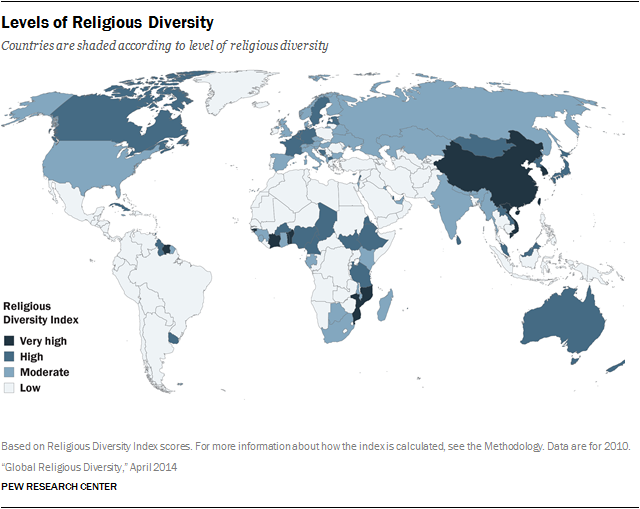 Religious diversity differs substantially by geographic region. Among the six regions analyzed in this study, the Asia-Pacific region has the highest level of religious diversity, followed by sub-Saharan Africa. Europe and North America have a moderate level of religious diversity, while the Latin America-Caribbean and Middle East-North Africa regions have a low degree of religious diversity.